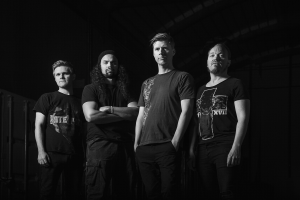 Diretone is a Danish groove metal band with a thick organic sound founded in 2011. Combining heavy grooves, Scorching leads, down-tuned guitars, clean vocal delivery, and a traditional approach to metal songwriting. And instead of venturing into winding and overly technical sections, the focus is on accessibility and the bands impact as a hole. Diretone is essentially a live band a guaranteed to leave heads banging in front of the stage. Recently the band left the stund Mix & Master. The album will be released through Gateway Music October 16th dio finishing off their second album with producer Tue Madsen, Antfarm Studio behi2017. In spring 2014 the band released a single called „Triggered“ and also made their first video appearance for the song. And In 2013 the band was invited to play a couple of shows at the „Meet in Beijing“ festival in China. Since the band released their self-titled debut album in late 2011, Diretone has grown a solid following across the globe.